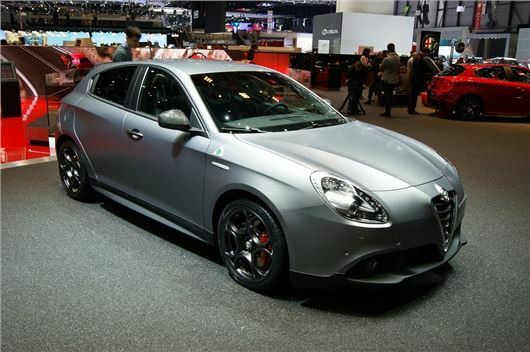 New Alfa Romeo Mito and Giulietta Quadrifoglio Verde performance models have been unveiled at the Geneva motor show. The name, which translates as green four-leaf clover, originates from Alfa race cars from the 1920s and has, in one form or another, been associated with performance Alfa models since. The current Giuiletta Cloverleaf will be superceded by the Quadrifoglio Verde which is powered by the same turbocharged 1750 TBi engine with 240PS and 340Nm of torque. Acceleration from 0-62mph takes 6.6 seconds which is 0.2 seconds quicker than the outgoing model. The Quadrifoglio Verde comes with the Alfa TCT six-speed twin-clutch gearbox as standard with steering-wheel paddle shifters. There is also the DNA system which allows you to adjust the gearbox speed, throttle response, engine performance and steering. On the outside the Quadrifoglio Verde comes with an anthracite finish on the door mirrors, grille and door handles along with anthracite alloy wheels. As you'd expect from a hot hatch it has a rear spoiler, side skirts and large exhaust pipes. Inside there are leather and Alcantara sports seats, bespoke instruments and a new steering wheel. As with all versions of the 2014 Alfa Giulietta, standard equipment includes the Uconnect touchscreen multimedia system and Bluetooth. To mark the launch, Alfa is selling a special Launch Edition Giulietta Quadrifoglio Verde. With a limited run of just 500 vehicles, 100 of which are destined for the UK, the special edition gets carbon-effect spoilers, front and rear sports air dams and side skirts along with 18-inch alloy wheels with a five-hole design. It's available in Alfa Red or in Competizione Red (triple coat) as well as the exclusive Matte Magnesio Grey, pictured above. The MiTo Quadrifoglio Verde gets a new 1.4-litre MultiAir turbocharged engine with 170PS and 250 Nm of torque in Sport mode. Like the Giulietta it has the TCT automatic in place of the six-speed manual gearbox previously fitted. It can return 52.3mpg according to the official figures with Co2 of 124g/km, notable improvements on the model it replaces. The 0-62mph sprint takes 7.3 seconds. Alfa is also launching Alfa MiTo and Giulietta QV Line models. The QV Line model will capture the essence of the Quadrifoglio Verde but will be offered across a broader range of engines. The availability and final specification of QV Line models in the UK will be announced at a later date.